Explosive & Entertaining - Renovating Samba Soccer to compete in the 21st century. 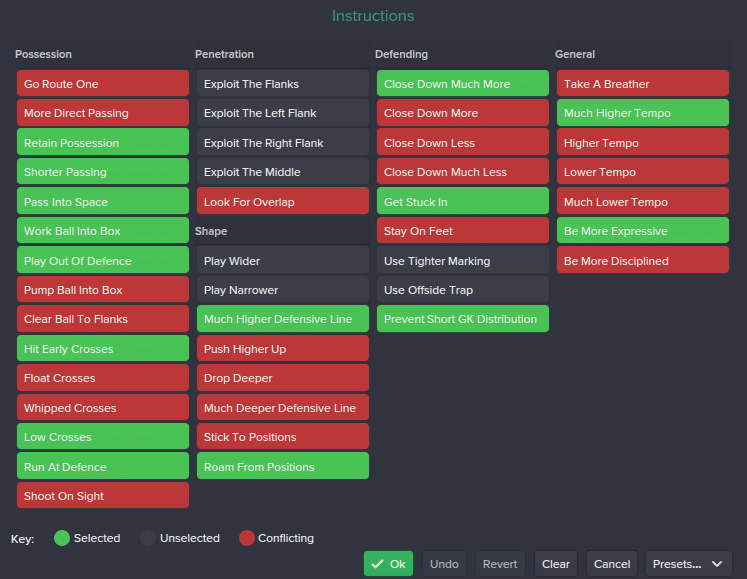 A Football Manager 2015 tactic. In this year's FM, I wanted to refrain from simply taking full inspiration from one man's tactics and replicating them in-game. I wanted to leave my own mark on the tactical world of FM. I felt that I was ready to design and implement my own tactical systems in to my one-and-only FM15 save to date, which has now spanned over 17 seasons with Whitehawk FC of the lower divisions in England, and internationally with Spain and Brazil. With Whitehawk, I created, and subsequently released, a tactic called Hawk-Eye 4-3-3 which I had success with. I then went on to further fine-tune this tactic and I will be posting an updated version of it in the coming weeks. It was my time as Brazil coach that saw me experiment quite a lot with one particular tactic. 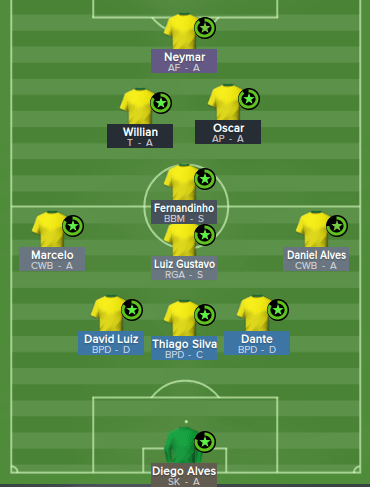 I wanted to create a unique tactic with Brazil to compete in the 2031 Copa América with. 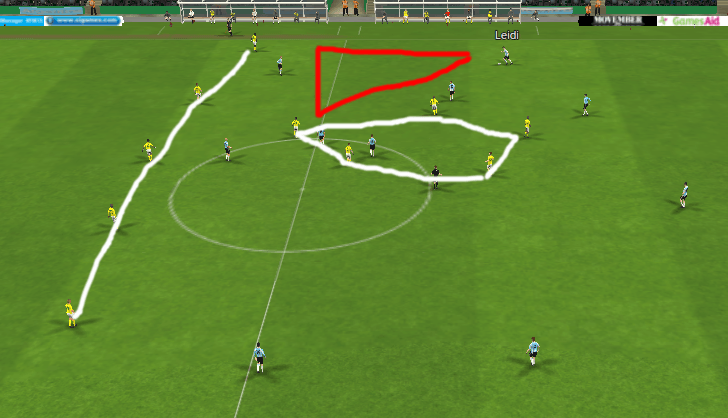 In previous FM's, I had experimented with 3 at the back formations but with no luck. This time was going to be different. I took some inspiration from Brendan Rodgers' and Pep Guardiola's tactical experimenting from the 2013/2014 season, which you can see in this tactic, but I also looked to uphold the Samba soccer traditions. The magical movement of the flair players, the rhythmic flow of the ball, the creativity of a wizard at work. It was magic that I wanted, and magic that I found! *NOTE* These aren't the players I used, but I have no screenshots of the players I did use. As you can see, it is a 3-4-2-1. In goals is a Sweeper Keeper. There is a back three of Ball Playing Defenders, with the central one in a covering role. There are two advanced Complete Wings Backs on either side of a Regista. In the middle is a Box To Box Midfielder, with an Advanced Playmaker and a Trequartista behind an Advanced Forward. This formation is extremely narrow and compact in midfield, and you will see that in defence when the two wing backs move back to make a flat back five and the team looks to push the opposition out wide. However, the wide areas are covered as the attacking players have instructions to dribble out wide with the ball while the wing backs will push forward with every attack. Strategy: This is your mentality when you take on an opponent. My Strategy is set to Control as I like to be the team on top by putting the opposition under constant pressure, without over-committing going forward. I am aware that Samba soccer is all about attacking football but I do feel the need to have a slightly more conservative approach with the team strategy, while the attacking players have freedom to do as they wish. There is still plenty of attacking football in this system, I can assure you of that! Passing Style + Tempo: The team will look to Retain Possession with Short Passing. However, there is an element of free-flowing passing, as my players will look to Pass Into Space. You can only be a threat to the opposition if you have the ball and it is important to hold on to it. Brendan Rodgers and Pep Guardiola recognised that and their sides both show a great interest in keeping hold of the ball whenever possible. We like to play at a Much Higher Tempo in order to keep the ball moving around very quickly and to keep it away from the opposition. Attacking Play: This is Brazilian football, and we do have a Much Higher Defensive Line than what is standard. This squeezes and boxes in the play in the opposition's half and gives us ten players in positions where they can get on the ball and contribute to the play. To go with that, we do look to Play Out Of Defence and build from the back. Your defence is your first line of attack, and so you should utilise that. To keep the Samba roots, the players are instructed to Run At Defence with the ball and when they are forced out wide, to Hit Low & Early Crosses. The Brazilian way is very technical with the ball on the ground and so the crosses should be low. Samba style of football suggests that the players have freedom to Roam From Positions and to Be More Expressive, and this is visible in this tactical system. Defensive Play: When we don't have the ball, it is all about winning it back quickly and pressing the opponents to making a mistake. I instruct my players to Close Down Much More and to Get Stuck In so that we can forcefully disarm our opponents. In recent days, a lot of teams like to build from the back and so we counter this by Preventing Short GK Distribution. Goalkeeper: The man in nets for me is a Sweeper Keeper (Attack). I like my keepers to rush out and close down opposition players who have penetrated my defence. Along with that, my keeper must be my 11th outfield player at times and be able to use the ball at his feet. He will distribute it short and quickly, and to the playmaker when possible. Defender - Centre (Right): All my central defenders are Ball Playing Defenders, with this one in the Defend role. He will pass the ball short and get involved in play. However, I've decided not to give my defenders permission to dribble with the ball in case they lose it and we concede a potentially dangerous counter attack. This does go against the Samba code, but some sacrifices have to be made to succeed. Defender - Centre: All my central defenders are Ball Playing Defenders, with this one in the Cover role. He will pass the ball short and get involved in play. However, I've decided not to give my defenders permission to dribble with the ball in case they lose it and we concede a potentially dangerous counter attack. This does go against the Samba code, but some sacrifices have to be made to succeed. In the Cover role, this defender will drop five yards deeper to cover for the other two defenders if they cannot get the ball. He will try hold his position as best as possible so that he can always be the last defensive unit. Defender - Centre (Left): All my central defenders are Ball Playing Defenders, with this one in the Defend role. He will pass the ball short and get involved in play. However, I've decided not to give my defenders permission to dribble with the ball in case they lose it and we concede a potentially dangerous counter attack. This does go against the Samba code, but some sacrifices have to be made to succeed. Wing Back - Right: This player has the Complete Wing Back (A) role. He will do everything I need him to in attack and defence. When defending, he will go back to make a back five but will close down the ball whenever possible. In attack, he will stay wide and provide low crosses for his fellow team mates. This player has the most running to do and quality in this position is necessary as he provides both attacking and defensive support. Defensive Midfielder: This guy is my Regista. He acts like a playmaker by constantly looking to create chances for the attack from deep. He is aggressive when defending and will do whatever he can to win the ball back. While the team attacks, the Regista will move in to places where he can contribute to play from deep. This player has a license to be more direct with his passing and also to dribble with the ball when he has it. He should be a very technically gifted player with good defensive skills. Wing Back - Left: This player has the Complete Wing Back (A) role. He will do everything I need him to in attack and defence. When defending, he will go back to make a back five but will close down the ball whenever possible. In attack, he will stay wide and provide low crosses for his fellow team mates. This player has the most running to do and quality in this position is necessary as he provides both attacking and defensive support. Midfield - Centre: This guy is my Box To Box Midfielder. He will run from the back to the front, and back again. He needs to have good physical attributes and good all-round skills as he contributes to all sides of play. He's the link between defence and attack in many cases. Attacking Midfield - Centre (Right): This is the Advanced Playmaker (Attack). He is to be highly creative and productive in the attacking third in fashioning out chances for team-mates and for himself. He will roam around the final third to get in to positions where he can create a chance and has the freedom to do as he wishes on the ball. Attacking Midfield - Centre (Left): This is the Trequartista (Attack). He is similar to the Advanced Playmaker but does next to nothing in defence, instead acting more like a poacher in that regard. He is a great creative outlet and in this system, is more inclined to fashion chances for himself than the Advanced Playmaker is. This guy is your second biggest goalscoring threat. Striker: This guy is an Advanced Forward (A). He leads the line and is your number one goalscorer. He will also close down defenders off the ball, while also looking to bring his team mates in to play too. He'll link up with the AP and the Treq in attack. This is how your team will set up defensively. As you can see, the defensive line is pushed up very high to make it difficult for the opposition to get out of their own half. The two wing backs dropped back to make a back five, while the midfield and attack are central, forcing the opposition out wide. This will happen in both halves of the pitch, thus restricting the opposition's play to the wide areas on the most part. 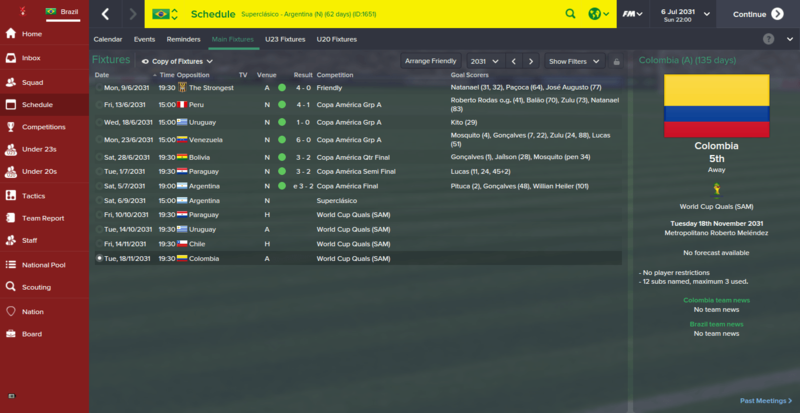 Below are the results of using this tactic in the Copa America 2031. The set-piece instructions are only relevant to the squad of players which I used. Do not take them as part of the tactic I'm sharing with you, as they are not. This tactic does not guarantee you good results, no tactic in the world does that. Some tactics fit a team, while others do not. Make sure your players fit in to this tactic well if you are going to use it, otherwise you may find difficulty getting results. Lastly, it will take time for your players to become familiar with this tactic and style of play, stay patient and they will become more confident in it. I hope whoever uses this tactic enjoys it and has success with it. If this tactic doesn't work for you, it's a pity. Like I said before, if you don't get good results with it, don't blame the tactic (or me). Some tactics just don't work for some teams. I might look to upload some more tactical systems before the release of FM16 and if you guys have any ideas about this tactic or another, please feel free to share in the comments below. This tactic is not the perfect tactic, but perfection can only get worse! It works in version 15.3.2?? Wolfgang, I'm certain that would be down to your management of the tactic and the players Like I said multiple times in the article, this doesn't tactic doesn't guarantee results of any kind. Is this tactic going to make us lose 7-1 to Germany?